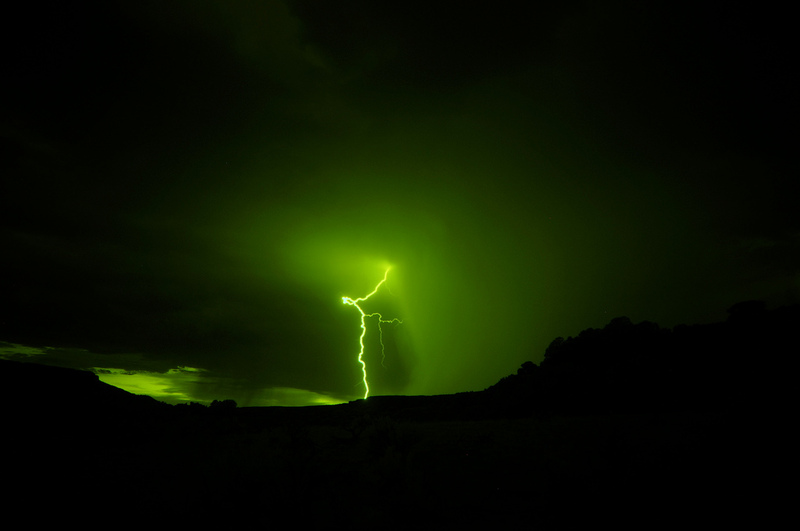 Green lightning is a rare weather phenomenon that some people have been lucky enough to witness. It’s almost the same as lightning, except its color is an eerie green. There’s a simple theory behind it, as well as some misconceptions. The only time green lightning has actually been photographed was when the Chaiten volcano in Chile erupted, spewing a cloud of ash into the sky. 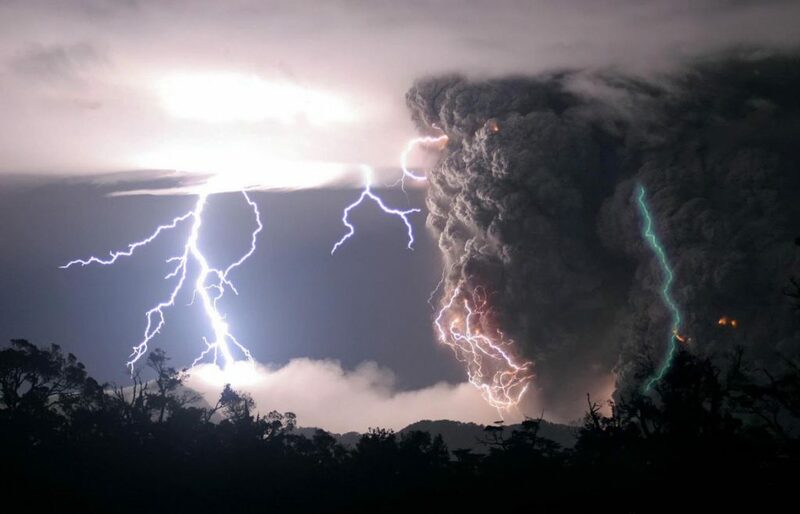 Volcanic ash commonly has lightning bolts in it, a phenomenon known as volcanic lightning – except this time, the plume of ash had an eerie green lightning bolt in. This remarkable photograph was captured by Carlos Gutierrez. Arthur Few, a scientist from Rice University seems to have solved the question of why green lightning was only seen here and not elsewhere. According to Arthur Few, green lightning is actually far more common than we realize. We just don’t see it all the time because it usually happens inside the cloud rather than outside. The green lightning is a streamer, or a channel of positively charged molecules that is attracted to an area of negatively charged molecules. When the two channels meet, the circuit is completed and energy is discharged. As for the green color, that’s most likely due to oxygen molecules being supercharged by the energy from the bolt, then losing the extra energy. As lightning jumps from one area of a cloud to the other, there are probably plenty of streaks of green lightning – but since the ice crystals that are the reason for the static charge buildup are inside the cloud, we don’t see the bolt of lightning. It was visible in the ash cloud because the ash particles(which collide and generate static charge) are on the outside of that cloud. Arthur Few suggests that if we were able to see inside of clouds, we may be able to see green lightning more often. Perhaps not qualifying exactly as green lightning, a related phenomenon is a green flash that sometimes occurs during severe weather. This is actually known as a power arc. A power arc is when a high voltage power line is short circuited, resulting in an arc of electricity. This arc only lasts a few seconds, since most power lines have some sort of safety mechanism built in to mitigate damage from these short circuits. These shorts are incredibly powerful and bright, and can involve tens of thousands of amperes. The arcs can be blue, green, turquoise, and even orange – which is why many people report seeing “the sky turn green”. Often this short knocks out power, so a green flash is also associated with a loss of power in that area. The arcs are sometimes referred to as “exploding transformers”, though transformers are not always responsible. An arc can be caused by any simple short circuit, whether the wind causes to power lines to touch, a wet branch bridged two lines, or a squirrel was unfortunate enough to walk across and bridge the circuit. If this phenomenon is caused by lightning, it is known as a “flashover”. Flashovers are when lightning causes bridging between two power lines or a well grounded object, resulting in a very bright – sometimes as much so as lightning – flash of light coming from the ground and going up. There seems to be some folklore in tornado-prone areas that a green sky is indicative of a tornado. This seems to be more of correlation than causation! The hues we observe in the sky are due to the way white light from the sun is scattered throughout the atmosphere. On a typical, clear day, the violet and blue spectrum is scattered the most, which is why we observe the sky to be blue. The light from the sun during sunrise or sunset has to travel a much greater distance through the atmosphere, so even more spectra are scattered, leaving us to perceive the last colors of the rainbow: yellow, orange, and if it’s really hazy, red. Researchers have found that the sky can turn green during thunderstorms if the storm cloud is aligned with a setting or rising sun, and you’re at the right angle to observe it. It simply influences the way the light scatters, that’s all. As for green skies meaning tornados, well, green skies usually indicate a large, tall thundercloud, and those are commonly associated with tornados and hail. Does a green sky mean a twister is definitely headed your way? No. But are you going to be in for some stormy weather? Quite possibly!